Join us for a night of readings with San Francisco Poet Laureate Kim Shuck, Ingrid Keir, MK Chavez, Aja Couchois Duncan and EK Keith. Kim Shuck is a poet, weaver, educator doer of piles of laundry, planter of seeds, traveler and child wrangler. She was born in her mother's hometown of San Francisco, one hill away from where she now lives. Her ancestors were and are Tsalagi, Sauk and Fox and Polish, for the most part. She earned a Master of Fine Arts degree in weaving in 1998 from San Francisco State University. As a poet Kim has read her work around the US and elsewhere. In late 2005 she toured through Jordan with a group of poets from all over the globe in the interest of peace and communication. Shuck reads her work on local radio frequently. Kim's visual art has been included in shows both locally and abroad such as a textile show at the National Museum of Taiwan in Taipei and Art, Women, California at the San Jose Art Museum. Sheconsults with museums and galleries around California on the subjects of Native artwork and community inclusion. \Kim continues working in schools and has taught at all levels: at San Francisco State University as well as many elementary schools. Her work with the Exploratorium, a hands on museum in San Francisco, is included in that museum's "Across Cultures" series. She's been teaching since 3rd grade when she organized and taught a class on crochet. Her work generally touches on poetry, art, math, storytelling, humor, and whatever else seems useful at the time. 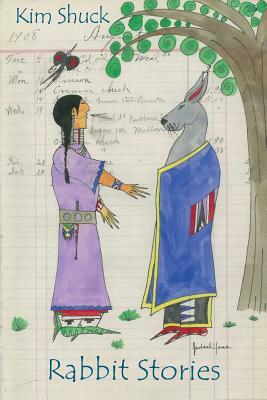 Rabbit is a trickster in Cherokee stories. He makes wagers, he talks his way out of being eaten and he is generally an unreliable being. I've always had a soft spot for him. He is thought to be an inspiration for the Brer Rabbit stories. It's also been said that the Cherokee got him from other South Eastern traditions which may or may not be true. Poetry. Women's Studies. DEAR ANIMAL, is a re-imagination of the Linnaean taxonomy from a feminist perspective. This collection is a love letter to the resilient feral female and an exploration of the myriad Animalia that dwell in the margins. Poetry. Hybrid Genre. Lush with elemental imagery, Aja Couchois Duncan's RESTLESS CONTINENT communes with a North America that speaks elegiac, celebratory, and melancholic histories human and geological. In this collection, the body of that land and those histories fuses with the body of Duncan's language, the body of memory, and the physical body.